LAST week we published illustrations and a short description of a new machine we called "a Flying Venturi Tube," recently constructed by the Italian Caproni firm. As a matter of historical interest we reproduce ДальшеMore>>> on this page photos of three machines constructed in France by M. Jourdan during 1911-12, which embody a somewhat similar arrangement. 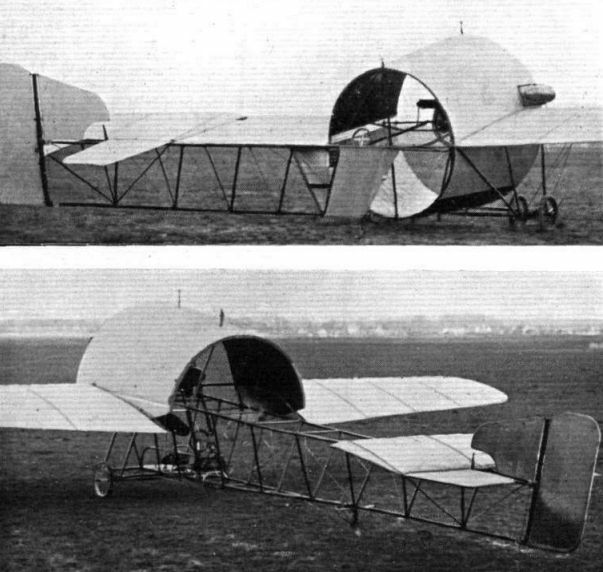 As may be seen, these three machines, which have varying arrangements of the "tubes” (one being semi-tubular), differ from the Caproni mainly in the length of the "tube." In the first machine shown the pilot is located below the "tube," and the engine (50 h.p. Gnome) is mounted centrally in front of same, with the propeller outside. In the second machine the "tube" has been enlarged, and the engine and propeller placed inside the forward end of the "tube," while the pilot is located at the rear end, where he is efficiently cooled by the slip stream!